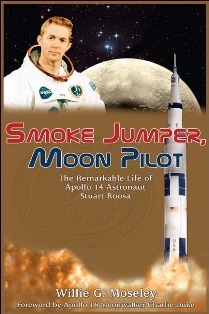 Currently a senior writer for Vintage Guitar Magazine and editor/columnist/photographer for The Tallassee Tribune, Willie G. Moseley has written an entertaining and informative biography on the life of astronaut Stu Roosa in Smoke Jumper, Moon Pilot, Moseley’s eighth book. Stuart Roosa was a colorful, adventurous character whose life experiences ranged from a summer as a smoke jumper, parachuting into isolated areas to fight fires for the U.S. Forest Service, to orbiting the Moon in 1971. In between those jobs he was a fighter pilot for the Air Force. Author Moseley recounts the hilarious efforts made by Roosa to impress the woman he would eventually marry. Earning his flying wings in 1955, Roosa began piloting an F-84F Thunderstreak and later Super Sabre jets for the 510th Fighter Squadron. Roosa could be compulsive at times, proposing to his soon-to-be wife Joan on their third date. She turned him down but Roosa would not be deterred. The Langley Air Force Base pilot decided that drastic measures would be needed to get her attention: He’d fly his supersonic Sabre “to treetop level” over the houses hosting parties where Joan would be on dates with other men. When he flipped on the jet’s afterburner, a thunderous “boom!” would prompt party attendees to drop to the floor as Virginia homes shook as though an earthquake had struck the East Coast. The brazen suitor finally convinced Joan that he was committed to her when he announced at a party that she had agreed to marry him. However, Joan had done no such thing. Eventually she agreed and Roosa’s introduction to his future in-laws was to “buzz” their home in a jet as he had previously at Joan’s soirees. Duly impressed, his future father-in-law gave Roosa a list of friends whose homes he also wanted “buzzed” by the pilot. The author’s account of how the first American in space, Alan Shepard, returned to flight reveals a remarkable slice of insider space history. Shepard had been grounded a few years after his 1961 flight due to an inner ear infection, which surgery later corrected. Not having flown in eight years, Moseley writes that Shepard reportedly told Deke Slayton, who was the Director of Flight Crew Operations, that he wanted to be the commander of the next lunar mission, which was Apollo 13. Shepard was essentially throwing his weight around as the first American space voyager; a sympathetic Slayton agreed to let him not only be Apollo 13 commander, despite not having flown for nearly a decade, but to also choose his own crew—rookie space travelers Stu Roosa and Ed Mitchell. When Shepard chose Roosa to be the Command Module Pilot, Roosa allegedly expressed doubt that Shepard’s team would be a primary crew without serving as a backup crew first. Shepard reportedly responded, “I don’t fly backup to anybody!” When Slayton submitted the three to NASA as the primary Apollo 13 crew without having logged time in a backup role, however, the space agency refused. NASA did agree to let them be the primary crew for Apollo 14, which would become the third manned-mission to the Moon in the wake of the Apollo 13 near-disaster. Edward Reynolds is a writer living in Birmingham, Alabama.